The Gilcrease Museum's 2011 Rendezvous exhibit features two dynamic artists, Veryl Goodnight and Curt Walters. For its 2011 Rendezvous Artists' Retrospective Exhibition and Art Sale, the Gilcrease Museum, located in Tulsa, Oklahoma, presents the works of Veryl Goodnight and Curt Walters. The retrospective opens to the public on April 14 and highlights works from each artist's prolific career, plus several new works that will be available for sale during the opening of the show at the Evening with the Artists and Art Sale April 15 at the museum. Curt Walters, known for his plein air impressionistic paintings, particularly those of the Grand Canyon, is not only an "ambassador" for Grand Canyon conservation, but has raised over $500,000 to preserve the pristine quality of this magnificent natural wonder. While the dynamic landscapes of New Mexico and Arizona have long dictated this renowned artist's preferred choice of subject matter, Walters has spent over 30 years capturing his impressions of the world's landscapes; from Claude Monet's gardens at Giverny to the splendor of Florentine architecture, the exotic temple gardens of Bali, to a recent trip to Spain, France, and Italy over the winter that he was excited about when Western Art Collector caught up with him at the Cowboy Artists of America show and sale in October during which he was one of three judges. 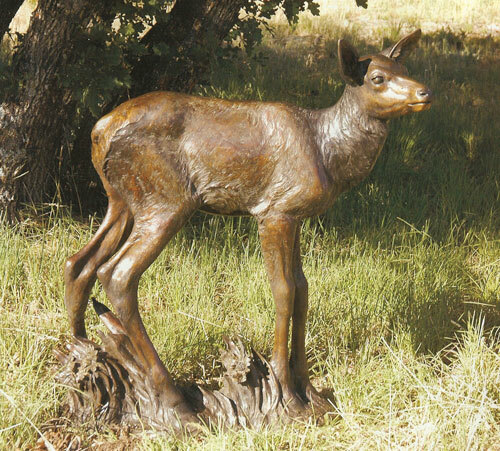 Veryl Goodnight, on the other hand, uses her artistic expertise to sculpt Western and animal subjects in bronze. Descended from Charles Goodnight, legendary Texas cattle baron, Goodnight is an artist whose work reflects the American West and brings to light the pioneer ideal. Sculpting since 1973, she is one of today's best known Western sculptors working exclusively from live models. She has raised many of her animal models, including bison, deer, elk, goats, sheep, prairie dog, coyote and bear. Her work has evolved over the years from sculpting only animals to sculpting people and animals, with her gentle works evoking a sense of companionship between the two.